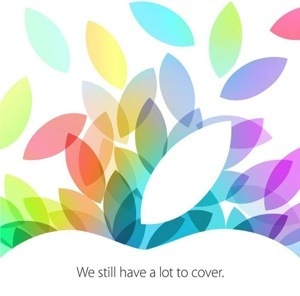 Apple’s “We Still Have a Lot to Cover” event on Tuesday, October 22, 2013, is already being pre-analyzed by major media outlets. My favorite so far is Ars Technica’s article, since it evaluates things pretty much as I would, although like most others it speculates only about hardware and OS X updates. Oh, sure, hardware is important, but only inasmuch as it enables software features that solve real world problems for the enterprise, small businesses, and consumers. So the real news will likely be about software (and, perhaps, services). iWork is from 2009. iLife is from 2011. Final Cut Pro hasn’t seen a major update since it went to “X” a couple of years ago. Aperture has been at version 3.x for years. You’d think Apple had given up on software completely. Now look at the hardware: the iPhone 5S has a 64-bit processor in the form of an A7 branded CPU. It was recently shown to be the fastest phone CPU in the land. We pretty much know that the iPad 5 will get this, probably in the form of an A7X, with enhanced graphics (the iPad mini 2 will likely get either the A7 or A6X). Using such powerful processors to surf the web or check email is a huge waste of their capabilities. Computers are here to make our lives easier, and Apple is very good at simplifying complex software. Combine Apple’s creaky, long-in-the-tooth software with the most powerful hardware in mobile devices and you have the perfect recipe for a software renaissance. All these programs may not be updated at the same time, on Tuesday, but over the next 6 months, there’s a good chance each app will see a significant upgrade. With the release of the new iPhones in September, Apple made the iWork suite, along with iPhoto and iMovie, free of charge. There’s no such thing as upgrades in the App Store, so the new versions may not be free (that would be unfortunate). But free or not, the release of new software that takes advantage of all the super fast hardware on iPhones and iPads could transform the industry, in ways that hardware alone never would. Another thing to think about: iWork is available on the Mac (OS X), on the web (iCloud), and for iDevices (iOS). Each version has a somewhat different interface and supports somewhat different features. Now, that’s partly due to being mouse or touch optimized, but it does mean that files have to be converted when synced and users have to be retrained. What if Apple aligned their interfaces and feature sets to be much more alike? The “desktop class processor” in the iPhone 5S and iPad 5 could make this possible. So I think the real news on Tuesday will be software, not hardware.